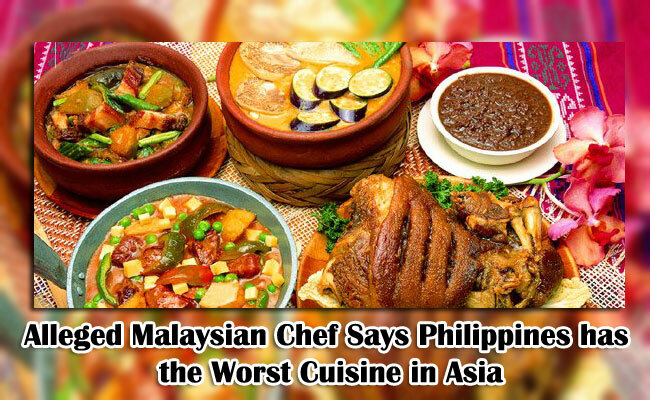 A news is spreading about an alleged Malaysian celebrity chef named Datuk Redzuawan Ismail, popularly known as Chef Wan, saying that Philippines has the worst cuisine in Asia. This was quoted by a certain news website. Lately, CNN has released its poll of the world’s best culinary destination through online voting and it so happened that Philippines ranked 2nd. Result shows that Taiwan topped the list with 8,242 votes, Philippines ranked 2nd with 1,528 votes, Italy at 3rd place with 810 votes, Thailand at 4th with 470 votes, Japan at 5th, and Malaysia ranked 6th. This news has caught the attention of so many Filipino netizens and they have shown their opinions through comments. There were even Malaysian citizens who are living in the Philippines who have defended its cuisines. What do you think about the issue? Do you believe the same thing that the Philippines has the worst cuisine in Asia? What Filipino foods have you tried tasting already? You are free to leave your comment below and let us see other people’s reaction towards this one.